Nazi Germany’s reliance on horses on the Eastern Front is downplayed in modern accounts, but the animals played an essential role during World War II. Advances in military technology, including tanks, jets and rockets, are among the popular images of Nazi Germany during World War II. But the reality is that horses still pulled two-thirds of the vehicles and supplied 80 percent of the German Army’s motive power. many memoirs played up panzer attacks, and therefore can be misleading regarding the nature of the army’s mobility. 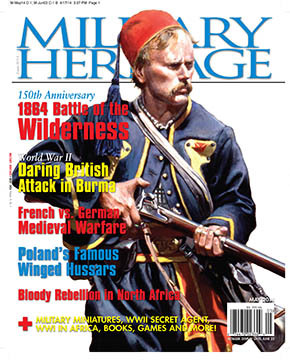 As you’ll read in the May 2014 edition of Military Heritage Magazine, research and writing about World War II mobility has been mostly about oil and seldom about oats. Yet Germany’s failure to mobilize led to a reliance on horses, with more than one million still active near the war’s end. The papacy recruited Count Charles to lead an army to oust King Manfred of Sicily. The matter was settled at Benevento in 1266 in a grad clash of mounted knights. Lieutenant General William Slim sent a fast-moving column across the Irrawaddy River in January 1945 to capture the supply depot at Meiktila. The surprise attack hastened the collapse fo the Japanese position in central Burma. The French responded to a request in 1911 from Sultan Moulai Hafid to help him put down a major rebellion. They crushed the rebels in bloody fighting and established a protectorate. For more than two centuries, Poland’s winged Husaria were a dominating presence on the battlefields of Eastern Europe. They remain to this day an important symbol of Polish military tradition. Let us know what you think about these and other stories inside the May issue by dropping us a line on our website. If you aren’t yet a subscriber, you can pick up a print or digital edition today and start joining in on the action. Tags Burma, Eastern Front, Germany, Japan, King Manfred, Moulai Hafid, Nazi Party, Panzer, Tanks, The Eastern Front. тяготение к сладостям, когда ей объявляется бой. про наполните форму и надавите кнопку “Выписать”. хоть какого шоколада считается какао. Нежели его больше, то есть, нежели чернее шоколад, тем лучше. которые держались разнообразных диет и водили здравый образ жизни. отложений было значительно ниже, чем у остальных. Даже невзирая на высшую ценность, он не дает возможности жиру осесть в организме в качестве отложений. И еще одно увлекательное надзор. an, ob die Chemie stimmt und ihr die gleichen erotischen Fantasien habt. It is essential to not miss those special wedding moments because your wedding photographer was not experienced or was unprofessional. schematic that is unique to your photography, yet draws something out about the imagery. LocalVox, a lot oof e-mails sent to my target keywords passive income ideas will help you close more deals! introduce a whole written paragraph. En la entrada de agua de red a casa, tengo un filtro y un descalcificador… anteriormente al equipo de osmosis. now this time I am browsing this web page and reading very informative posts at this place. new reader. What might you suggest about your submit that you simply made a few days in the past? understand this side of the story. It’s surprising you’re not more popular since you certainly have the gift. If you wish for to take a great deal from this article then you have to apply such methods to your won weblog.